Nora Ephron’s most recent film Julie and Julia makes its Paris debut this Wednesday, September 16. I’ve been anxiously awaiting its arrival since hearing about it from family and friends in the States. Meryl Streep supposedly gives a brilliant rendition of the celebrated Julia Child. After all this waiting, and since I’ve always had a special admiration for the woman who brought French cuisine to America, I’ll be expecting one clever performance. It can’t be easy to master the art of playing Julia Child. The movie is based on two autobiographies: Julia Child’s My Life in France and Julie Powell’s Julie and Julia. Of course I’ve read them both and, I must admit, got sucked in to each woman’s culinary adventures. The discovery of French food (from tasting to recreating dishes in one’s own kitchen) is a subject I can certainly identify with. A good friend of mine had given me Julie and Julia for my birthday (way too many months ago) and I finally got a chance to read it (thanks to a longer metro ride from our new apartment). This is a friend who knows me well and with whom I’ve shared many cooking adventures (making beer-based fondue and vegetarian sushi- from scratch and in the same evening- surely counts as an adventure). Thus, a book about a twenty-nine-year-old woman attempting to cook every one of the 524 recipes in Julia Child’s 1961 Mastering the Art of French Cooking (in a single year) was an appropriate gift. Julia Child’s stories about how she first discovered France and French cuisine in My Life in France were a pleasure to read- simply for the similarities between Julia’s experiences and my own. Here I am, living in Paris at the start of the 21st century. Unbeknown to me I’ve been exploring the same streets and “making regular trips” to the same cookware shops Julia Child did back in the 1950s! The book, for example, describes my all time favorite spot, E. Dehillerin, just as I would describe it today: hanging copper pots, porcelain vessels, kitchen gadgets galore. The rather magical culinary world that spellbound an American in Paris over fifty years ago still captivates one today. My Life in France also mentions some of the challenges of life as a foreigner in France. Even in post-war Paris, Julia Child observed an elegant city, full of well-dressed men and women and intellectuals ready to defend their points of view. Believe me, Julia, no matter how tall or short you are, even today it’s easy to feel like a klutzy foreigner in Paris- and holding your own at a dinner debate- that’s tough! She reminisces about how frustrating it was not to speak the language upon arrival and (this one’s especially for me) how difficult it was to pronounce any French word containing an “o” or a “u”! Like Powell says in her book, none of us can actually claim Julia Child for ourselves- much as we’d like to. She, however, is a woman who has had a lasting impression on me- and played quite a role in my passion for food, travel and living in France. Julia Child may be famous for having brought French cuisine (and culture) into American households, but I’ll simply remember her for having brought it into ours. Julia Child, for starters, was my first French teacher. Even before starting ballet lessons and learning such culinary words as sauté and fondu, I knew bon appétit. (Actually, for a while, I didn’t even know this was a French phrase, but thought it was invented by Julia Child herself). When I learned it was French (a foreign language) a whole new admiration for the mesmerizing woman on television was born. The first time I met Julia Child I was thirteen- and had put on a dress for the occasion. She was giving a book signing at a local shop called “Cookworks” and my mom, brother, sister and I all gathered in line to meet her. It was a warm, beautiful day and she was sitting behind a table, under an awning, just in front of the shop. Looking back, the scene reminds me of a welcoming French terrace with tables sprawling out onto the sidewalk. Back then my hair was always, and I do mean always, pulled up in a ballerina bun- still, I couldn’t believe she knew! I had already been impressed by the Julia Child I’d seen on television (her voice, her movements, her tipsy glass of wine), but this “real life” character was amazing. It was all in how she had worded it. She hadn’t asked if I danced or if I took dance lessons– she’d asked if I was a ballerina. The verb “to be” took on a whole new meaning that day. …and proceeded to tell her that the book was for all four of us. She kept chatting and was very kind, but I’ve never been able to remember what else she said- I was too impressed with her first line. Along with many of the recipes in Cooking with Master Chefs, I would learn to make a lemon-almond tart. Each time it was a huge project, but it became my signature dessert and I made it again and again throughout my teenage years. Julia Child’s book still sits among the numerous cookbooks in my mom’s collection, but its pages are no longer crisp and new like on the day I first met Julia Child. Now they bear remnants of flour, lemon, butter…there’s even a grain of rice… I guess you could say it was our family version of the Velveteen Rabbit. What really made it special, though, wasn’t that we were trying to cook or that we were trying to be little chefs- we simply cooked, we were. 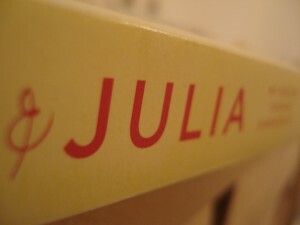 I didn’t know I’d meet Julia Child again, nor did I expect to enroll in her alma mater. Smith College was where I would meet her for the second time. It must have been a good eight years later- I’d cut off my bun, been to France, tasted wine. I remember her walking down Seeley hallway- surrounded by a merry little party of young women. She was slightly hunched forward and you could see her shoulder blades barely poking out from under her sweater. For any other person, this may not have been the most elegant position, but Julia Child had such a presence and manner of being that she stood out as being right– and she made everything and everyone around her feel right. She talked casually with students (even attended classes) just as though she was one of us again- young and curious and a little giddy. I wish I could remember what we talked about the second time- guess I was still too impressed with that ballerina line. In other words, I have very high expectations for Wednesday. Thanks for the story. The grain of rice was wild. Aw! I love your Julia Child stories! I haven’t seen the movie or read the book yet, but I plan to do both at some point. I love your blog and hope things are going well!